I’ve recently started using an amazing new fishmongers that opened up near me. The quality of their fish is amazing and their fish monger is extremely knowledgeable (always a good sign), so I’ve been dying to try out a few new fish recipes with the produce I recently bought from there. 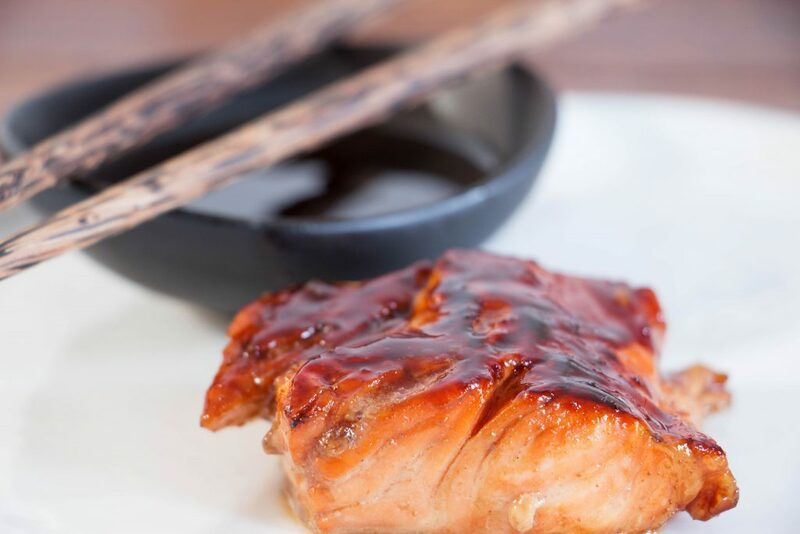 This succulent Teriyaki Glazed Salmon is the first of those recipes and is definitely one of my favourites. Making your own teriyaki sauce is unbelievably easy and uses pantry ingredients that most people will have in their home – so no shopping necessary! When I make my own teriyaki sauce I’m able to easily control how sweet/salty the sauce is and it gives me a little more control over the flavours I want to use. I like to make a large batch of it and then keep it in an airtight jar in the fridge. I can then use the sauce for any other teriyaki recipes I fancy in the following few weeks. I use it in both my Udon Noodle Soup and Teriyaki Stir Fry. The best part about this recipes is how well the sticky and sweet teriyaki glaze goes with salmon. You need a strong and flavoursome fish to hold its own with Asian flavors and salmon is perfect for this. Pan frying the salmon meas you get a crispy, almost charred exterior whilst still keeping the salmon juicy and soft inside; it also has the added bonus of being very quick to cook, so no waiting around sat in front of your oven. I like to serve up this teriyaki salmon with some simple white rice – which I usually mix in with any extra teriyaki sauce for added flavour. Place a large saucepan on a medium heat and add in the soy sauce, water, brown sugar, garlic, ginger, rice vinegar and honey. Give it all a good stir and bring to the boil. Then reduce the heat and leave to simmer for 5-7 minutes, whilst the sauce thickens, stirring occasionally. 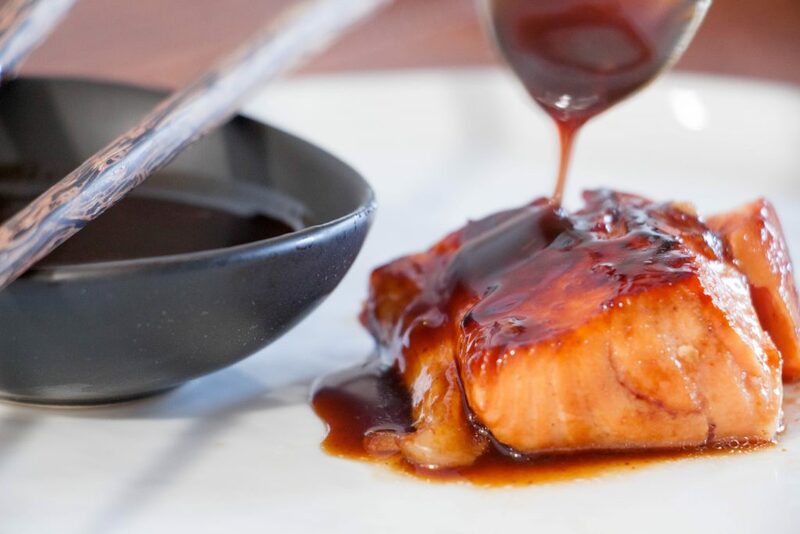 Whilst the teriyaki sauce is simmering away, place the salmon fillets in a large bowl and add in 3 tablespoons of the teriyaki sauce from the pan, making sure that all of the salmon fillets are covered with the sauce. Place the bowl into the fridge and leave to marinate for at least 2 hours. Next, Put the teaspoon of cornstarch into a jug and add a little cold water, until the mixture is smooth, then gradually add the mixture to the teriyaki sauce. Keep the sauce on a simmer and stir regularly for 3-4 more minutes. This will thicken the sauce into a glaze for you to use on the salmon later. When you're ready to cook the salmon, remove the fillets from the fridge and put a skillet on a medium-high heat. Place the salmon fillets in the skillet. They'll need about 3 minutes on each side. Keep adding the glaze to the salmon as it cooks and blackens. 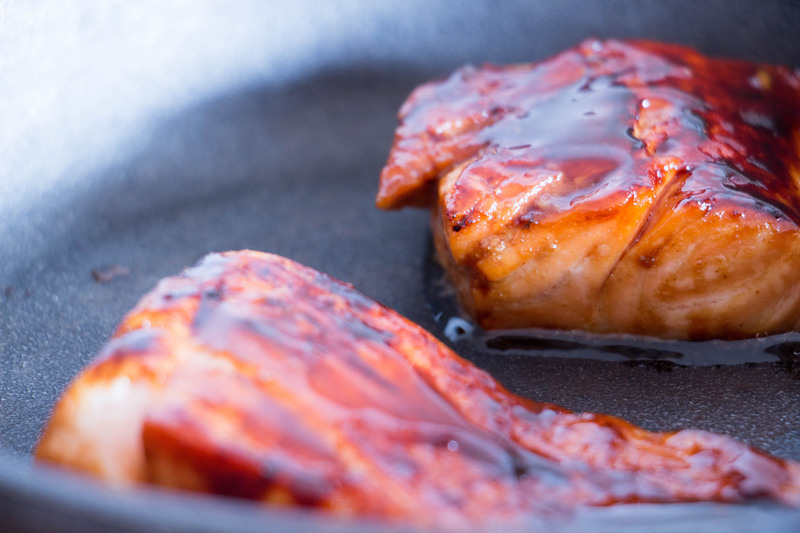 Remove the salmon from the skillet, plate up and add an extra dollop of glaze! Could you let us know which recipes you’re referring to? Thanks! wow just made this for dinner, I already have been making teriyaki sauce from scratch for quite sometime, and decided to pair the salon with it! What a great idea 🙂 I also added black rice and broccoli as sides. Great recipe, so easy and delicious !